You may or may not be a student but if your child is off to College or University don’t pass on the opportunity for them to spend 10 minutes reading this post about cooking and living independently away from the family home. I’ve been a student in University twice in my life and both times I made sure to have a stocked food pantry to stop me from eating out which is a HUGE waste of money for any student. It’s one thing to be social and another to be lazy in the kitchen if you are able to cook at home. I had many friends who considered themselves the starving student only because most of their student budget went to booze, partying and eating fast food. That’s a sure-fire way to starve your budget and your tummy of nutritious food. What I’ve learned throughout my frugal student years in the kitchen may serve as a handy reminder that you CAN eat decent meals at home and kick the fast-food habits many students take on when they move away for school. First off you need a student budget and trust me when I say this will be the one financial tool that will save you from a life-time of unwanted debt. If you find that your food budget is extremely tight don’t be shy to visit your local food bank or check to see if your school has an on campus food bank to get you through tough times. What do I consider a food pantry? A food pantry is exactly what it sounds like an area where you stock food. Many may consider this to be non-perishables and others like myself will consider non-perishable refrigerated and frozen foods. A typical food pantry may be a spare cupboard in the kitchen which is free-standing or a walk-in food pantry (our dream), a built in food pantry cupboard. If you’re like us you may have a cold-room where you can stock food and other products as well. Your refrigerator and freezer may also be included in your food pantry stock up list. Your food pantry will be different from your parents who likely will have double or triple the amount of products. Feeding more mouths and living in a permanent residence will add significantly more to your food pantry. 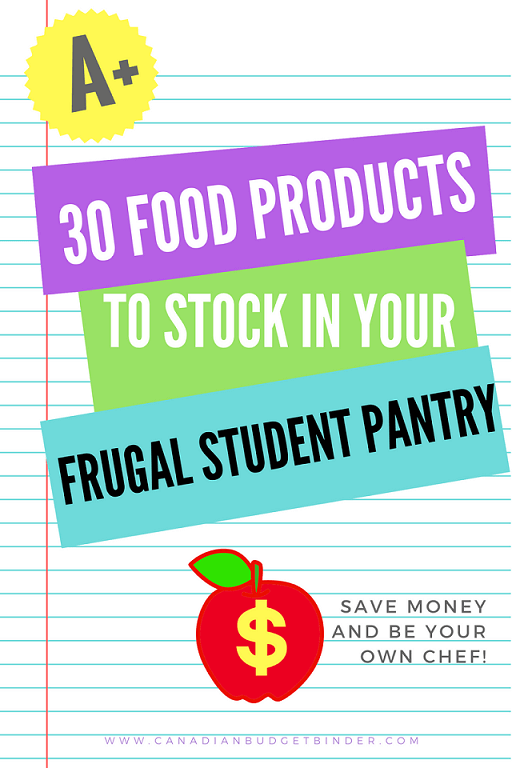 For the single student keep your food pantry simple and stock foods that you can mix and match with your favourite meals or that are staples to most recipes. Think of your food pantry like your wardrobe. For the student who doesn’t have a spare cupboard, refrigerator space, freezer space then you can do what we did when we were renting and used a box that was high off the ground to prevent any pests from getting inside the food. You can also use a large cooler which you can pick up at most second-hand shops or for around $20 at most retail stores. Back in the UK when my refrigerator broke down I remember using a cooler and sat it on the back deck in the winter. The snow kept it cold but with this you may attract outdoor friends so keep that in mind. I’m a grocery cart geek in the sense that I’m nosey and check out what other people are buying. If you see some goofball checking out what’s in your cart who happens to have a British accent, don’t be shy and say hello Mr.CBB. We live in a large University and College city and the grocery stores are flooded with students, every day when semester is in full-swing. The first two tips I will share with you both of which I learned fairly quick by making mistakes. If you’re cooking for one you won’t need a massive shopping cart which only encourages shoppers to fill it up. Stick with the shopping basket and you’re guaranteed to keep costs low and only buy the food you will eat. Food waste is a huge problem across the globe so being mindful of what you buy is imperative. How do you do this? You plan your meals. If you’re moving away to school for the first time grocery shopping and meal planning may be a new concept for you or you’ve had some training from your parents. With school only a month away I encourage parents out there who haven’t taught their adult children how to grocery shop to make plans to do so. This is such a valuable parenting lesson that you can pass on to your children because you want them to eat healthy meals and encourage home cooking. Not every student when attending college or university stays in residence where a full or partial meal plan is part of the housing package. That means if you don’t have a meal plan because you can’t afford one as they are costly or have moved off campus you need to buckle down and get organized. I’m writing this post before the start of the school year to motivate parents and students to cross this chore off the list. Grocery shopping is a task that most people don’t care to take on which only leads to eating out often or spending more money than needed. 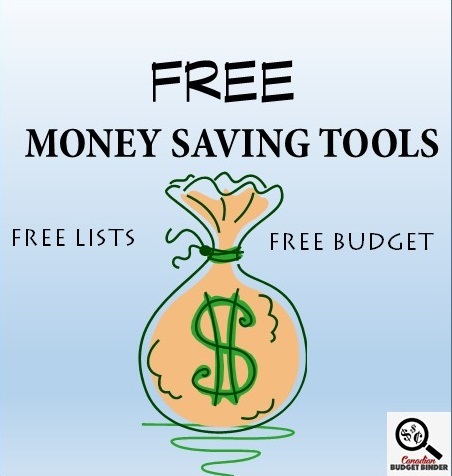 Using a list will help you not only at the grocery store but for everything in daily life. Life only gets hectic from this point moving forward. Between studying, part-time work and for those who have a family writing a list keeps things organized. Once you figure how much your grocery budget should be you will be armed with the task of creating a simple student meal plan with delicious meals that you can make with limited time. Studying and student life is a big deal and the last thing you want is to be stuck in a kitchen cooking and cleaning. Once you decide what you want to eat for breakfast, lunch, dinner and snacks you’ll have a better idea of what you’re looking for. You have to make cooking fun so switching up your favourite recipes is key to meal planning. If you need recipe ideas Pinterest is loaded with them and the perfect place to PIN your favourite recipes for later. Working with weekly sale flyers and coupon apps to create a standard grocery list will also give you the frugal edge to find deals and keep costs low. The cool thing about using apps such as Flipp is that you can also create a shopping list on your phone. If you’re anything like my wife she loses our grocery list all the time but she’s old-fashioned and likes her paper list. 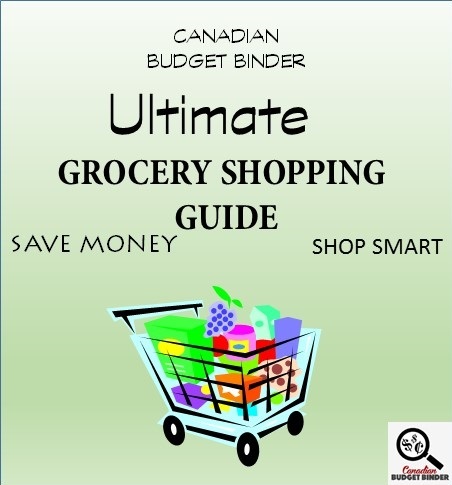 You will probably surprise your peers with your vast amount of grocery store knowledge and how to keep things simple, fresh and cheap in the kitchen. Most of all, delicious. Forget about all the crazy food craze diets out in the world of celebrity and keep things fresh, healthy and simple for the win. You’ll end up spending more money if you are chasing food for the perfect body than you will if you invest in a way of eating that suits your body. I often get emails from students who ask me what products should they stock in their food pantry to create meals apart from the obvious. Foods such as granola bars, fruit roll-ups, protein bars and other snack-related/meal replacement items aren’t part of the pantry stock up idea. Those foods are called Student-Survival-Foods or emergency food when you’re on the run or late for class. I used to stock up on my favourite snacks so I wasn’t running to the corner shop buying a bag of crisps that were double the price. You can still eat healthy and enjoy your favourite snacks in moderation BUT they are not considered a full meal. Today I want to focus on specific food pantry products that worked for my diet. They may not work for your way of eating however the idea of this post is to get you started on building a food pantry that will work for you. Once you have key recipe basics in stock you can then create any of your favourite meals as long as you have your vegetables and proteins ready to go. If school has you tied to your desk try to take a break and go grocery shopping. If you just can’t get away there are other options. If you drive you can click and collect order and pick up your groceries from select Loblaws stores, online grocery shopping with delivery or hit up the 24-hour grocery store. Note that I’m giving options and you don’t need to have each one of them depending on your diet and way of eating. These are just foods that I would stock in my food pantry as a student so I could cook meals that I loved at home. Remember to keep your food pantry simple and consistent so you are rotating stock and keeping meals interesting. Whole-grain Cereal/Instant-Oatmeal (sugar-reduced), Steel cut oats, Large Flake Oatmeal, Cream of Wheat etc. Raisins and Nuts- Cashew, Peanuts, Chia Seeds, Flax Seeds, Hemp hearts, Sunflower Seeds, Dried Fruits etc. Flours- All-purpose, Whole Wheat, Flax Meal/Flour, Almond Flour etc. Oils- Extra Virgin, Coconut Oil, Walnut oil, Peanut Oil, Sesame Oil, Vegetable Oil, Cooking spray etc. Honey/Peanut Butter/Almond Butter/ Sunflower seed butter etc. Whole Wheat Pasta, Cous-Cous, Brown Rice, White Rice, Wild Rice, Quinoa etc. Canned foods- Tomatoes, Pizza Sauce, vegetables and fruit, olives, mushrooms, tomato paste etc. Vinegar- White, Apple Cider, Wine Vinegar, Rice Wine Vinegar, lemon juice, Lime Juice etc. Cheese (any) Cheddar, Ricotta, Feta, Brie etc. Condiments (pick your favourite most-used only) Mayo, Ketchup, Mustard, BBQ Sauce etc. Pickles, Olives, Hot pepper rings, marinated vegetables. Don’t forget to keep your eyes open for blow-out prices, reduced prices and in-store specials. These will help stretch your grocery budget so that you can spend a bit more on must-have products that rarely go on sale. Stay tuned for next weeks blog post where I’m going to talk about what appliances and kitchen ware are essentials for the student kitchen PLUS.. where you can find them cheap!! What other must-have food pantry items would you suggest to cook healthy basic meals for students? Congratulations to Ballot #8 belonging to Angela M for winning the July Grocery Game Challenge! Please email me your address so I can send you your PC Financial Gift Card. Well done! This week was mostly about stocking up our food pantry with some staples we found on sale. We have to pick up a giant bag of Swiss chard this week that was given to us so that will add to the vegetables once we get that. I might even freeze it if there’s too much. Any good Swiss Chard recipes out there? How was your shopping week? Well I went over for the week big time. I did make it to No Frills so that was a big part of the overage but I saved long term with better prices for some staples. I still have a good amount to get through the rest of the month depending on sales. Still in good shape for cat food thanks to those BOGO coupons for Stuart and Molly’s Whiskas. Hubby is on a pickle kick right now so there were pickles on the bill. Eggs are on sale this week at Foodland for the 18 count containers. I might get another one before the sale is over…. I see you made the trip to No Frills! You picked up some great deals including the half off bread. We don’t eat much bread around here these days but we used to toss it in the freezer and stock up when we could. That’s a great price. The freezer is where the breads went as soon as I got them unpacked… Yes, with the staples I grabbed at NF I should be good for the month. The pickles and the tetras of juice were for hubby and they are going fast. He does this every so often and it can drive me batty. He wants to stock up of this or that and once I have lots on hand he stops eating the food. I have learned to not get too far ahead on his treats but he is already talking about going back to NF as he is almost out of the pickled onions and the other jar is gone. I’m in no rush and have no trip there planned. The grandson loves dill pickles so he will ask for a pickle when here. Your son and the pickle reminds me of the time the grandson caught his mom eating sour keys candies and wanted on, he was just under a year then. So she gave him one and he licked all the sugar off it then bit into it…the faces were so funny!!! But he ate it!!! Overview: We decided to do the bulk shopping every other week and then on the other week, we’ll get milk and produce. This week, we stocked up on meat to cut down on future purchases and gives us a variety of options. You have to pick your battles. Yes, it means more meals are decided earlier but depending on what you have in the house already, it can be easily changed. We like meat in our house so I was willing to spending the $100 on meat this round and know that it will last quite a while, as well as make many different types of meals. All together that’s $206 for the entire week and we had a really great time! We had picnics, several barbecues, walks, gym work-outs, family get- togethers, a corn roast at the farm market, free music performances, “dinner & a movie night” at home & we still managed to sleep in most days. That’s not too shabby for controlling the vacation budget but having oodles of fun! I have some pretty scoocum leftovers for hubby’s 1st week back to work too! Vacation Week 1 down, 4 more vacation weeks to go! –	a “walk-on” ferry day trip to Vancouver Island to see a friend in Nanaimo for lunch and to have a good visit. We haven’t seen her in a couple years but I talk on the phone to her every week. –	a few days mid-week in Bellevue, WA in the fall again using hotel points plus they have a Club floor for our breakfast and dinner needs leaving us to pay for our lunches only & I know where to get great food for small prices! I’ll also re-stock some of my gluten free supplies on this trip. –	an overnight stay in Burlington, WA for our anniversary celebration but we PAY for the hotel on this trip to keep our points active for another year. It’s only one night though and we already have the funds just sitting & waiting in our vacation savings. Dinner will be at our favorite steakhouse. It’s not fancy but the food is sure good and the prices are great! It’s a relatively inexpensive 22nd anniversary get-away but a nice romantic one that we’ll both enjoy. –	and finally a post-Christmas few days in Bellevue, WA where we have free hotel (thanks to our points & have Club Floor breakfasts and suppers included). We take our cooler along so that any holiday treats that we want to enjoy in the in the room are bought at the grocery store. We also have a small fridge but the cooler helps give us a little more flexibility. Our splurges are some nice lunches out, including my birthday lunch. I’m thinking we can probably have a grand old time with all these plans for less than $1,000. I’ll post the vacation spending & activities here to see how we actually make out though. Most of the spending is food with 1 hotel night, 2 nights parking & 1 ferry ride so it makes sense to share it here. Vacationing means we pay less for groceries at home but we spend from the vacation savings…juggle, juggle. OUR NEXT USA SHOP WILL BE IN SEPT. 2016. OUR CURRENT TOTAL UNUSED RESERVES ARE $964.01. This means the $936.51 that we carried forward from 2015 PLUS AN ADDITIONAL $688.47 that we have added in 2016, LESS $660.97 that we have drawn out for use in 2016. You would make an excellent vacation planner, wow!! I would hire you in an instant. I love how you’ve detailed your plans the way you have. I find when I am organized like you are here it’s easier to control the vacation budget. I love the idea of a staycation splurge too… might even do a GGC post on it for those people who simply can’t afford to go on a vacation venture or like us where we can’t get the time off to do so. What are Swiss Sloppy Joes? Limes, Lemons and Cauliflower all great deals. My wife likes to snack on cauliflower as it’s low carb. That’s one heck of a delicious grocery shop Mary!!! I’m also going to be making the family zucchini fritters when I get some in light of those delicious pancakes you shared on WFD tonight. You get ballot 1 for the start of August. Well done… loved this post! Mr CBB, we had 2 slices of Swiss Cheese left to use up so I got hubby to top his Sloppy Joes with them & melt the cheese under the broiler before putting the lid on his sandwich. He said it was delightful! That’s what I was thinking. I love the idea of adding cheese on top of Sloppy Joe. Sounds like you both had fun. I love the idea of the staycation grocery budget splurge!! I might just write a post about it although you pretty much wrote your own! haha. I can totally picture that!! In my house, there’s no top on our sloppy joes…too much bread that isn’t needed (for us). I don’t have any bread for mine…I do it as a lettuce wrap or serve it over a potato/sweet potato instead of using butter/sour cream/bacon bits. I’ve even had the meat over a nice big green salad!